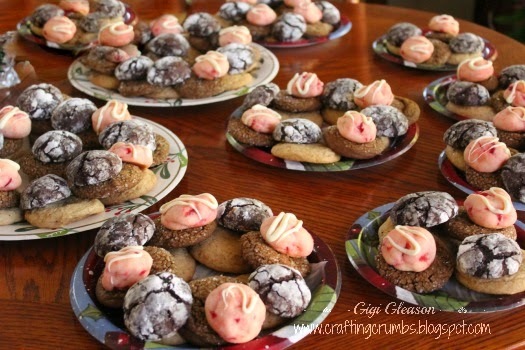 Christmas Cookies - A decadent memory from 2014! 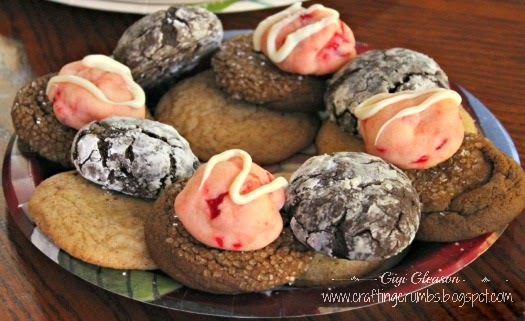 The week before Christmas I was busy making a wide variety of cookie dough and baking. The recipes are all courtesy of very talented food bloggers who receive full credit with the recipe links below. Every one of these turned out perfectly and some are clearly my new favorites! 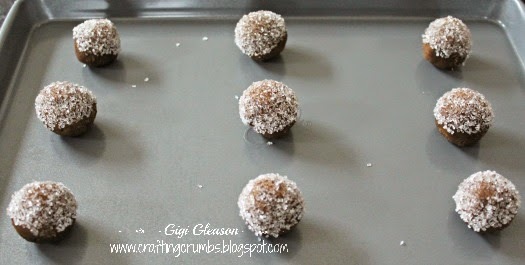 These were coated in sparkling sugar. 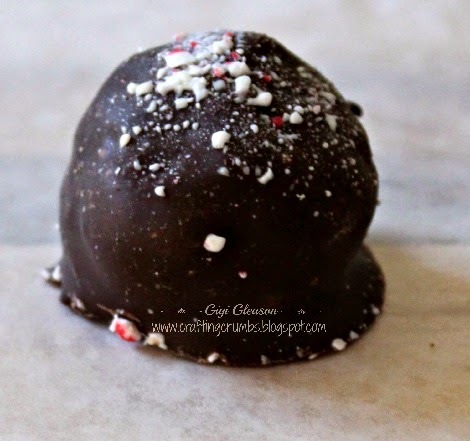 The sparkling sugar gave them a little festive sweet crunch! Creamy goodness on the inside.... scrumptious! If nothing else,I hope that this inspires you to try new things even when you aren't sure of the results. I took a bit of a risk and I am so glad I did! When I have to make a card for a December birthday, I want to make it reflect the time of year (wintery) without screaming "Christmas". Anyone celebrating a birthday during this festive and hectic time of year deserves to have a card that is not holiday based - at least that is how I feel. I shifted the colors a little just so you could see the detail in the snowflakes and the frosty film effect. 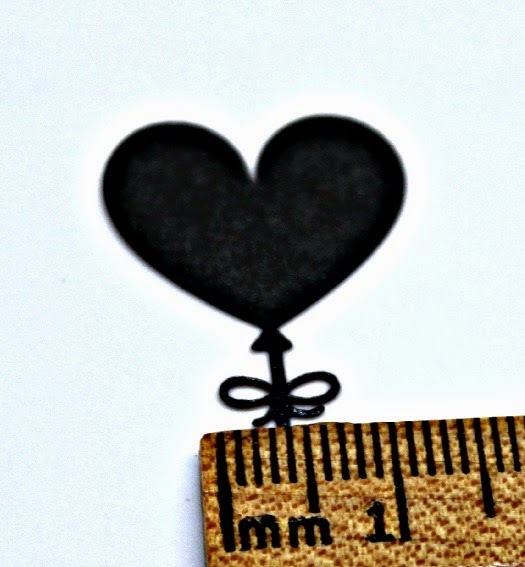 This design is from Miss Kate's Cuttables. 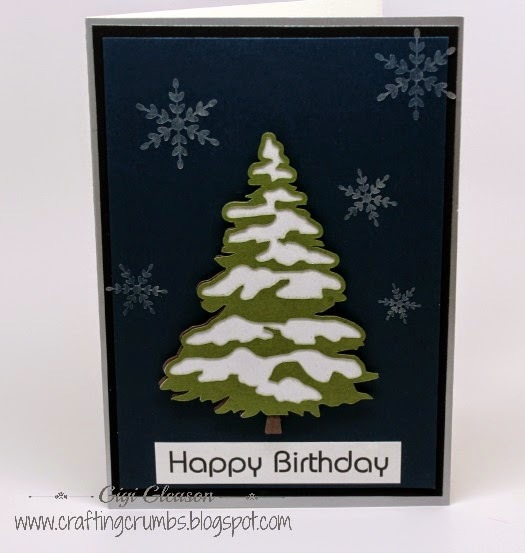 The winter pine tree (that came with the additional snowflakes) was one of her free designs during the month of December and I love how it turned out using papers from Paper Temptress. 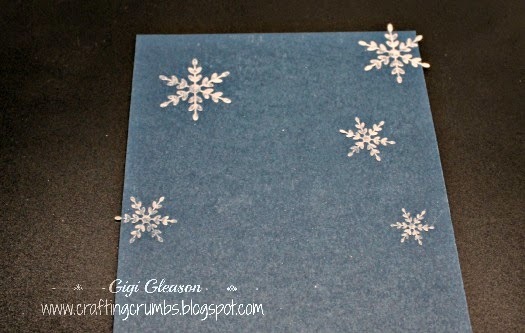 The snowflakes were cut from the Tim Holtz Frosty Film. 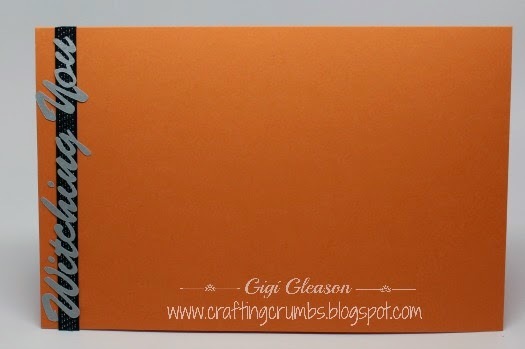 It cut much like vinyl - is very light and sparkly and I love the effect it gave the card. I don't know if this product is still made, but I am so glad I got several of them a year or so ago. Yes sometimes it takes me a while to use what I have! 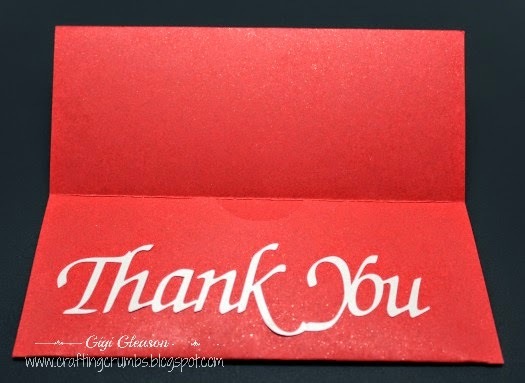 Tis the season to think of those who have made life a little easier the past year and deserve a thank you. Every Christmas I try to do something special for those who are constants in my life and go above and beyond the tasks of their job - the gardener, the UPS man and others. 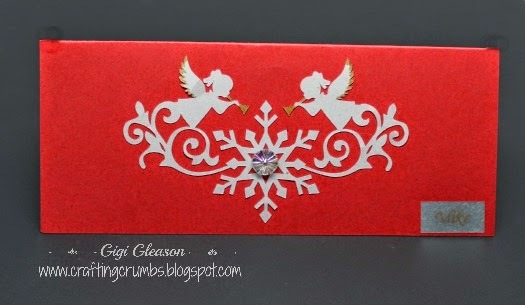 This year I used the money card template from Mamaw's Legacy (it's a very simple cut file) and I embellished it with the snow angel flourish design from Totally Jamie. This was a pretty intricate design and it cut out perfectly. 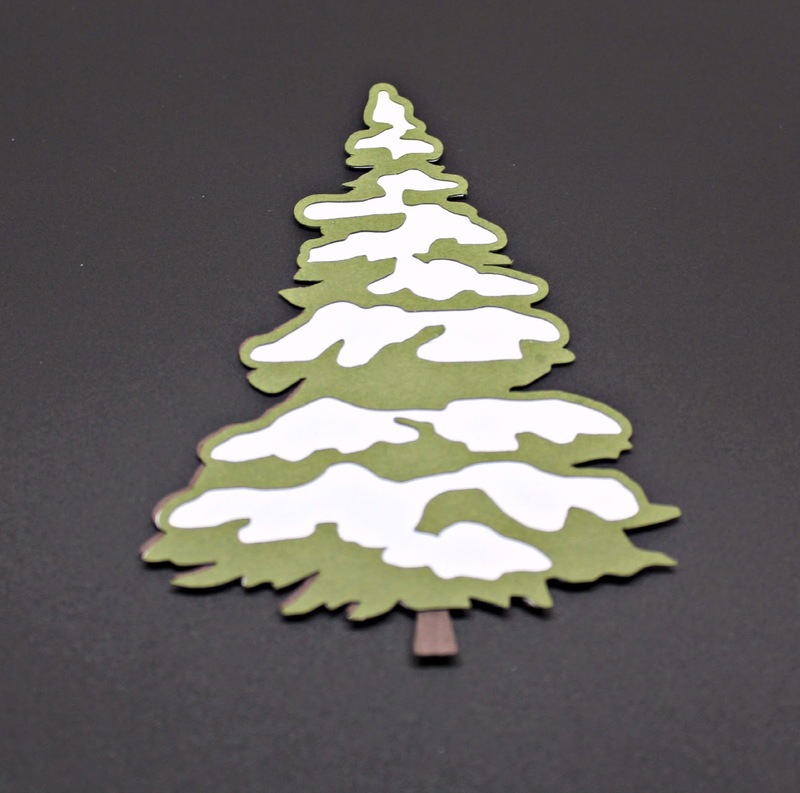 The flourish decoration is cut from Paper Temptress mica card stock. 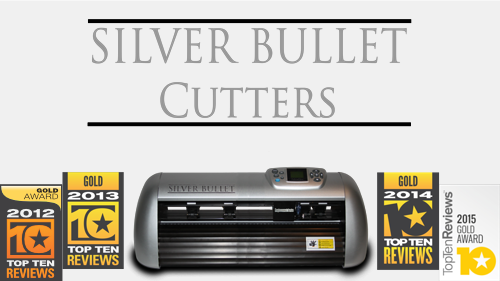 I used my Brother labeler with the gold on silver TZ tape to add the individual names to the money cards. 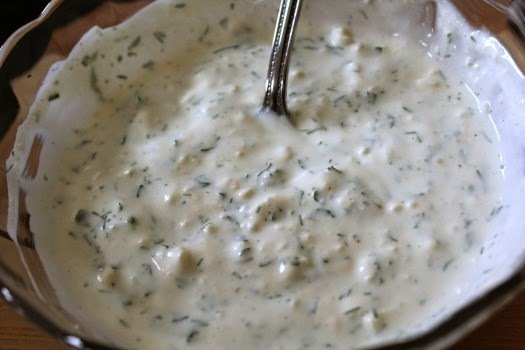 I have been a fan of the Litehouse OPA dressings since they came out, especially the blue cheese and the feta dill. 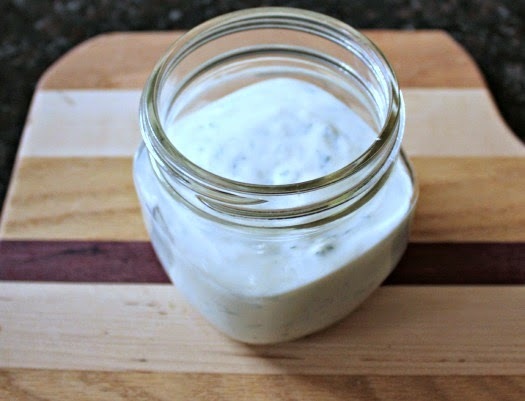 My dear neighbor gave me a "healthy" recipe for blue cheese dressing and Greek yogurt that is fabulous, so I thought I would use that as a base for trying the feta dill. I didn't nail it yet, but it's close. 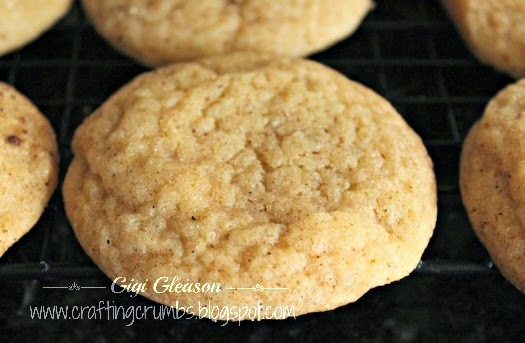 The best part is that it is super healthy, no preservatives, and amazingly easy. Took about 5 minutes to mix all of the ingredients and it just tasted so fresh. Full disclosure - you have to be a fan of feta cheese to like this dressing - there is no disguising the taste, but I happen to love it. I am not a big goat cheese fan - I know - **shock** - I have tried it every which way and just cannot jump on that bandwagon yet. I keep trying...... and then regretting it! 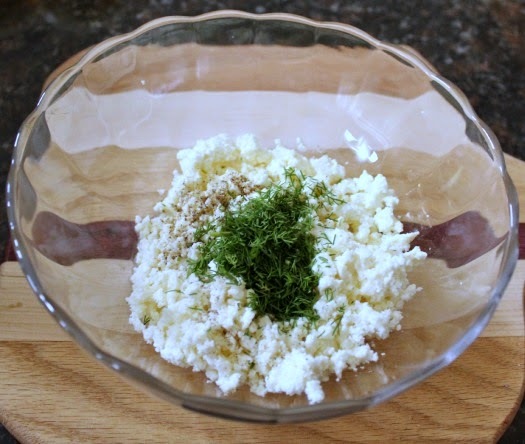 But feta cheese is another story - I am all in on that one. And brie... and just about every other cheese, but I digress. 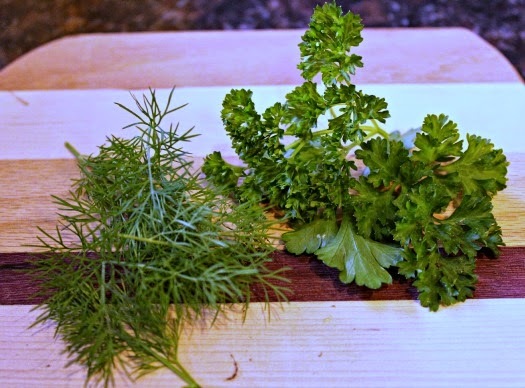 This salad dressing is one of those things that is best made at least a few hours before you are going to use it so the flavors can meld. It was better the next day and even better the day after that! I also love that it doesn't make a lot so for those who are not feeding a huge family, it won't end up down the drain because you couldn't use it in time! 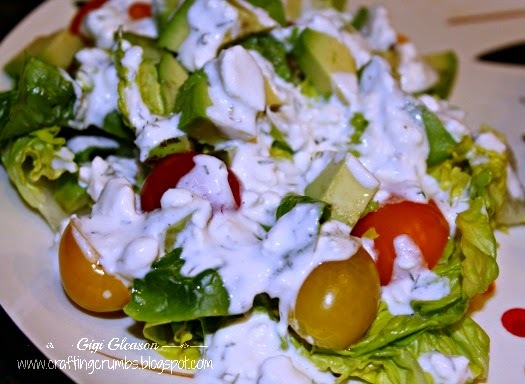 I would definitely make this again and am eager to try the blue cheese version next. Blend all ingredients well. Let it sit for at least a few hours before serving. The flavors are enhanced with time. I think this is my new favorite dressing. So it is difficult for me to let any occasion pass without a card, or in this case two! (will explain in a minute!). We were, however, supposed to bring a book for the baby instead of a card. 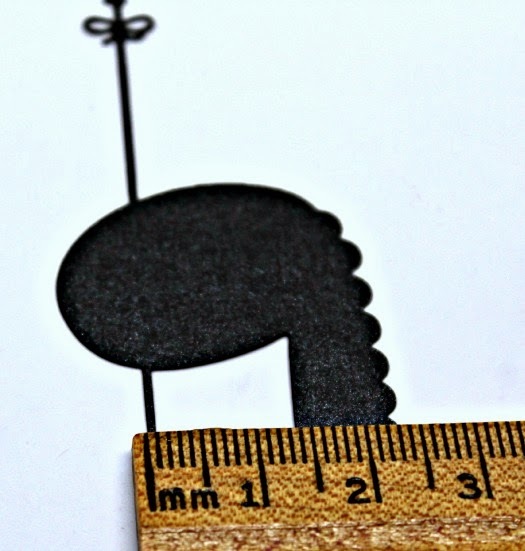 But I somehow could not fathom not making a card so I did a very simple one, thanks to a design from Miss Kate's Cuttables. The paper is from Paper Temptress and I repeated the gold heart "theme" in the card. I took several pictures of the card because every now and then this amazing machine surprises even me. Look at the minute detail in the background piece - the bow under the balloon and the string. That is so fine and it cut perfectly with no problems at all. This one was really fun! 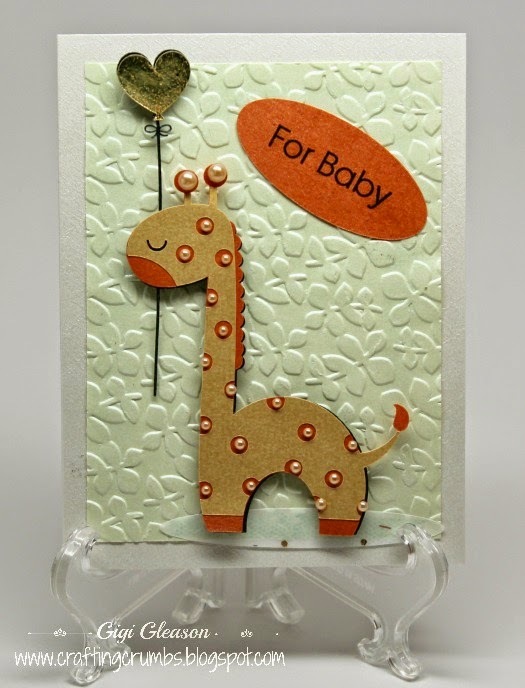 This is the backing piece of the three part giraffe! I made a second card since Megan's Mom and I went in on a gift together and of course it needed a greeting card from us! So...... stumped for an idea, I went back to the theme colors of the shower (black, white and gold) and incorporated the gold heart again that was prominent on the invitation and did an iris folding heart pattern using the leftover black and white patterned paper from the banner along with other remnants that I had. The lettering was cut out of Duck vinyl that was textured. I would not recommend it for a delicate font because of the ribbing in it, but for this it was perfect. Simple card but full of love from both of the grandmas. I really love how this turned out too. 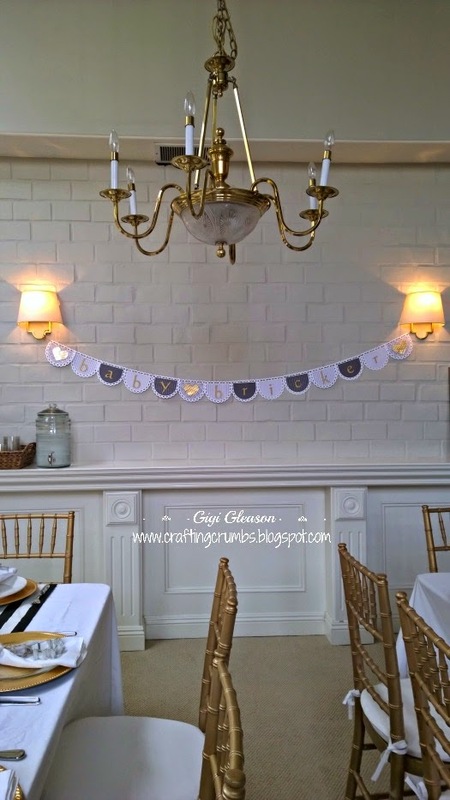 Baby Shower Banner - Part One! I finally had a chance to get a little bit crafty a week or so ago. 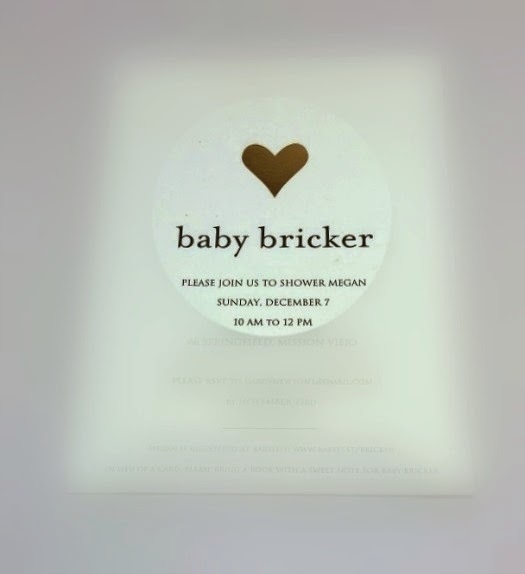 I haven't been able to share it because it was a project for my daughter in law's (Megan's) baby shower. It is so hard for me to believe that their precious little bundle will be here the middle of February - that is just around the corner! But today was the day for her friends and family to gather round and celebrate so now I can share!! Megan's sister asked if I could make a decorative "banner" for the baby shower. 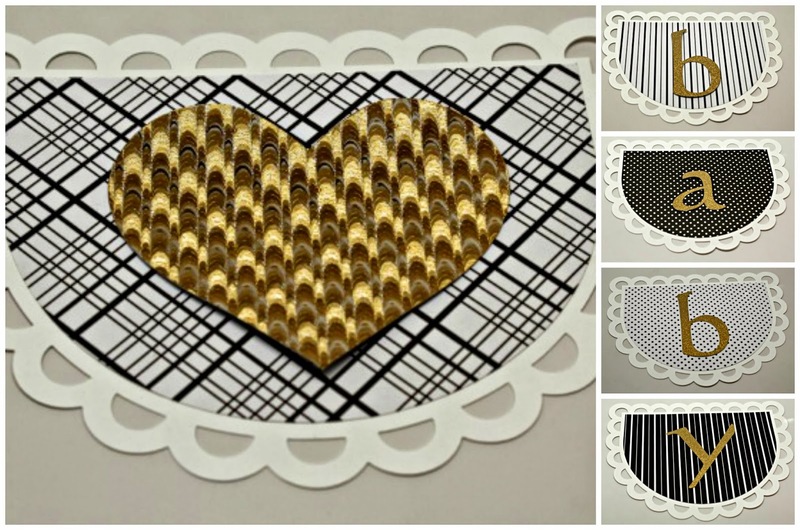 The colors were very classic - black, white and gold per the invitation. It was very simple and understated with a single gold heart. The editing altered the "white" a little but trust me , it was classy! They were staying away from colors because "you can just have so much yellow and green" (per Megan) and Megan and Scott are waiting until the baby enters this world to find out if it's a boy or a girl. So below is what I created to help add to the festivities of the day. I am so happy with how it turned out. (see the last photo in this post). Here is a sampling of the different papers used with the lettering. Honestly, I fell in love with this project as it came together. What was in my head translated well to paper - that is rarely the case! The design is from Birds Cards and is one of her pennant designs. After I chose it I realized why it jumped out at me - it looks a little like a baby bib! (ok - use your imagination!!) 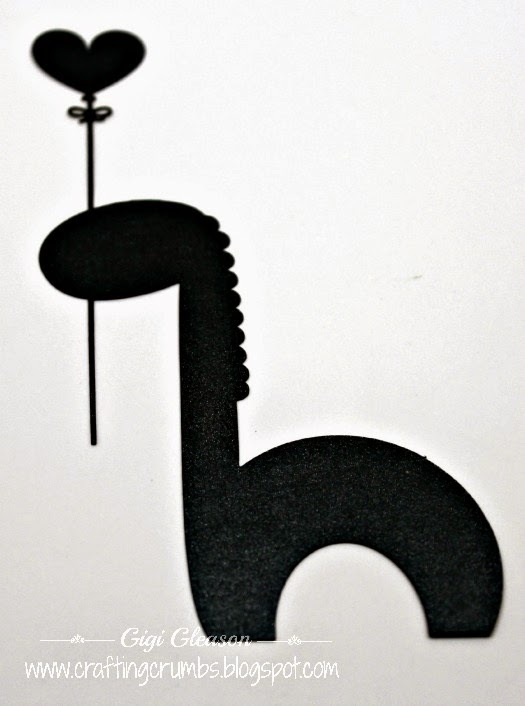 So I had some Recollections printed paper from Michael's in all sorts of black and white patterns and used that to accent the gold letters that were cut out of smooth gold glittered card stock. And the hearts were cut out of holographic gold card stock. I had some black and gold cording that I ran through the openings in the open scalloped border and it seemed to tie it all together. I was eager to see how it looked actually hanging up in the house. 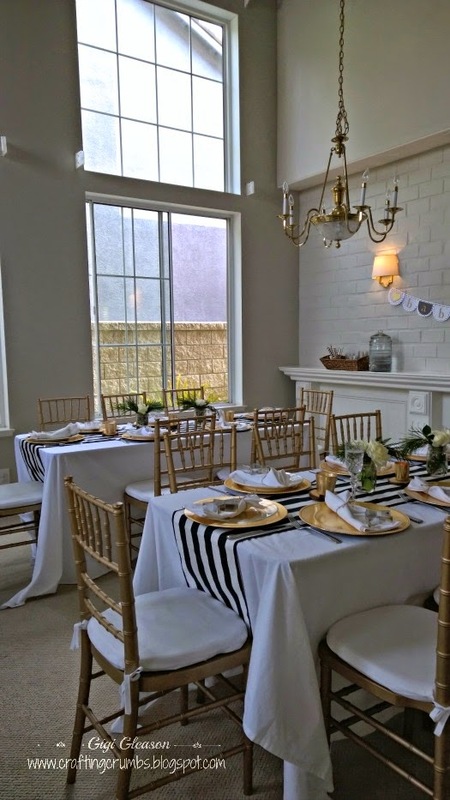 The shower was held in the home of a very dear friend and it was not only decorated beautifully for the holidays, but the touched of black, gold and white on the tables were absolutely stunning. It was a truly elegant setting. As you entered the home you could see the "baby banner" on the wall. 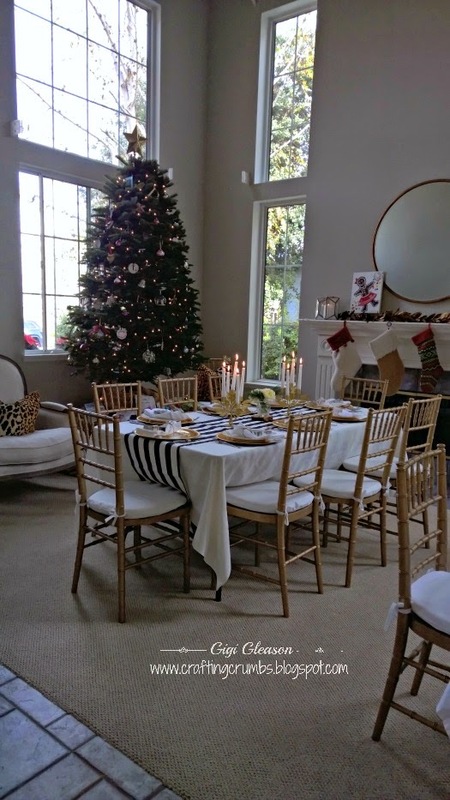 So beautifully decorated for a Christmas baby shower! gold chargers, white and clear plates - perfection! It was a truly lovely morning spent celebrating the pending arrival of this already much loved baby. After today, I think they have most of the needed essentials to help them enjoy every minute of this new adventure! And I heard tonight that this baby banner will be hanging in the nursery awaiting the arrival. In the next few days I will post the two cards I made that accompanied the gifts. It feels good to be crafting again. Pin It Now! This is the time of year when the coffee store that sits on many a corner in just about every city in America and beyond, offers seasonal bakery items. 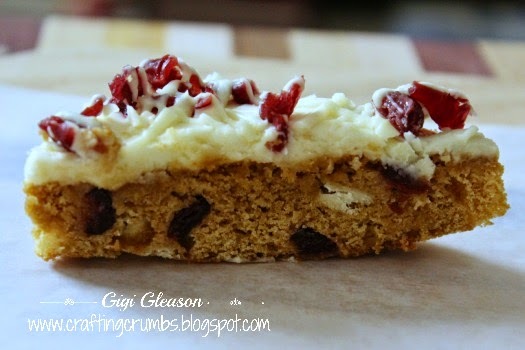 One of the most anticipated is the Cranberry Bliss Bar. I could not imagine what the big deal was until I tried it. It really IS delicious. Oh My Gosh! Of course I believe that anything with a healthy dose of cream cheese is guaranteed to be delicious - right? And this is no exception to my rule! 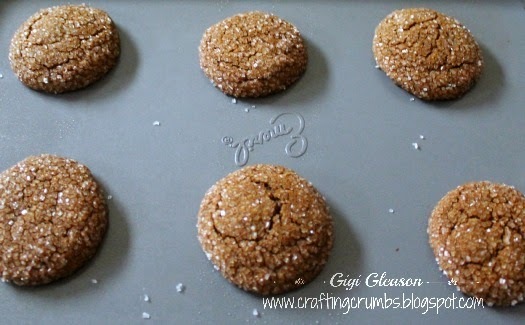 These are a "bit" healthier with whole wheat flour, sucanat instead of brown sugar, and egg whites and applesauce instead of oil or butter. This is the second time I have made them but the first time with fresh white wheat flour. I definitely would do this again and it has already been requested by my daughter who will be visiting for a few days right before Christmas. The "Mom please make" list is growing, but that's fine with me. I thoroughly enjoy baking, especially at this time of year. 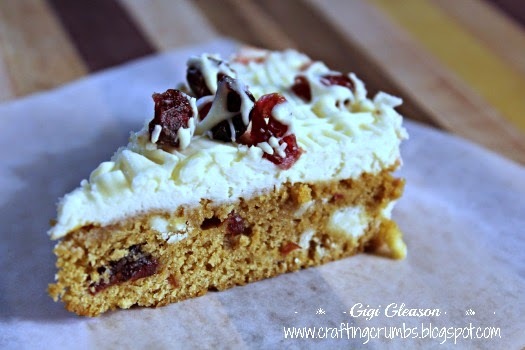 I hope you enjoy this recipe - I chose the Sucanat because I am trying very hard to keep things healthier and as pure as possible, but you could substitute with Truvia Baking Blend or other Stevia based baking blends to reduce the calories and sugar. I love having options! Preheat the oven to 350. Lightly grease a 13x9" pan. 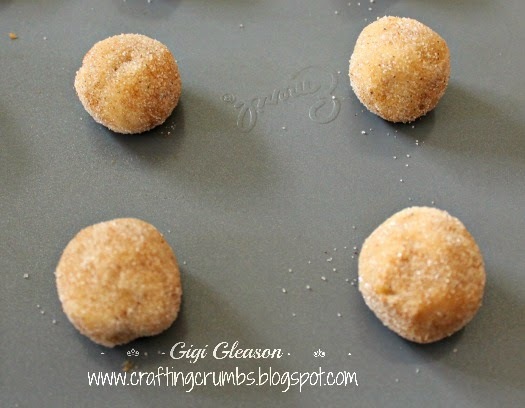 In a medium bowl, blend together the flour, baking soda, salt and cinnamon together. In a large bowl, whisk together the Sucanat, cane sugar, egg whites, applesauce, and vanilla until light and fluffy. Add the dry mixture to the egg mixture (in two additions) and blend well with a whisk. 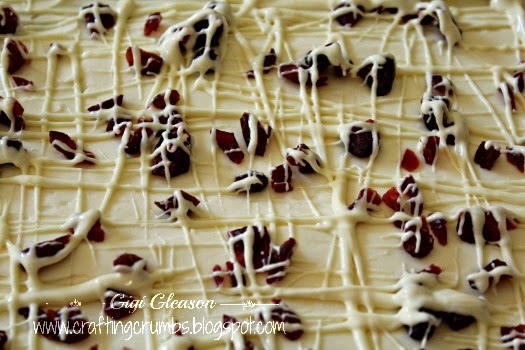 Fold in the chopped dried cranberries and white chocolate chips. The batter will be thick. 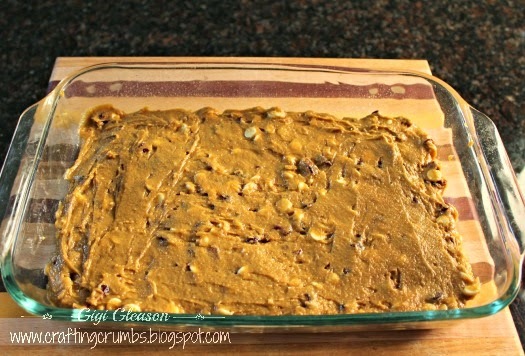 Pour into the greased pan and spread evenly. Bake for 10-14 minutes or until a toothpick inserted in the center comes clean. Do not overbake. Cool completely on a wire rack before frosting. For the frosting, beat the cream cheese (light is fine if you prefer), vanilla and the powdered sugar until fluffy. Frost. 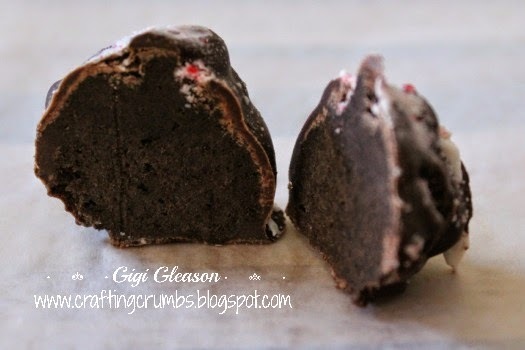 Sprinkle the chopped dried cranberries over the frosting and then drizzle the melted chocolate over the top. Refrigerate until ready to serve. Cut into bars. I hope everyone had a very happy Thanksgiving and that the month of December is full of wonderful tine with family and friends. I plan to share many more recipes and cards in the weeks to come. Stay tuned! My oldest granddaughter is FOURTEEN years old today - what the heck??? She can't be that old.......... Luckily she is still a sweet girl and the early teenage years have not ruined her......yet! Although I do think she would need surgical intervention to be "removed" from her phone, but that unfortunately seems to be a sign of the times.......... I love technology and the convenience, but I don't love that we often fail to have face to face conversations and text or email instead. I am guilty of it as well and trying to improve on making REAL connections.......... but enough of my editorializing! 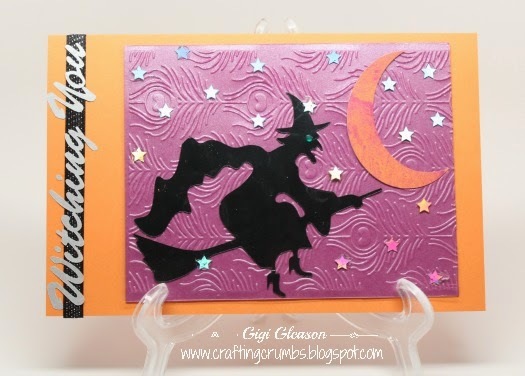 It is her birthday and I tend to do a Halloween theme since it falls the day before - and I have been having so much fun experimenting with the Silver Bullet and the FoilMaster that I turned once again to both. 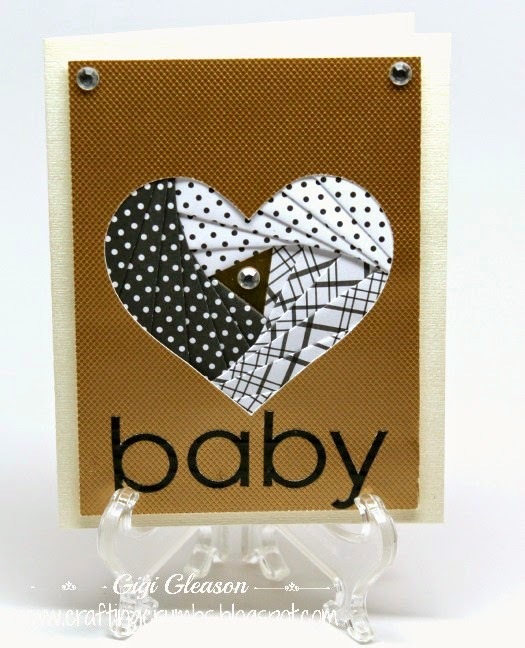 I had an idea to make a foiled overlay and just let me say - this will NOT be the last time I do this - too much fun!! So.... I found some royalty free clip art on the internet (so grateful that others can draw) - and traced the witch and the moon in SCAL and cut out. The witch is black luster card stock from Paper Temptress and the moon is from paper scraps. 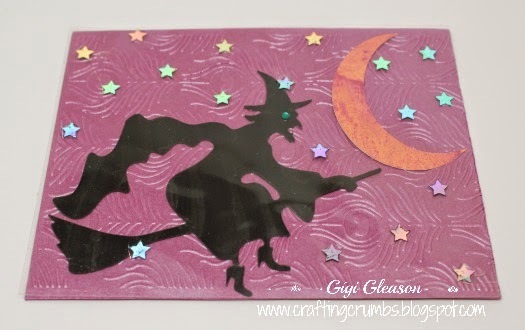 The background sky is mica card stock also from PT that has been embossed to look sort of spooky! Now to the overlay. I used SCAL to create stars scattered over a rectangle the same size as the embossed rectangle and placed them around the witch and the moon so they wouldn't detract from them. I did a print and cut of the stars, foiled them in silver with the FoilMaster and then cut the rectangle with the Silver Bullet.I placed some small glue dots under the stars so the transparency would adhere without visible signs of adhesive. I so love how this turned out. It was super fun and super easy and looks so much better in person. I hope she loves this special birthday witch! The stars are really silver but reflecting the light in the photo. I can hardly wait to do an overlay again. 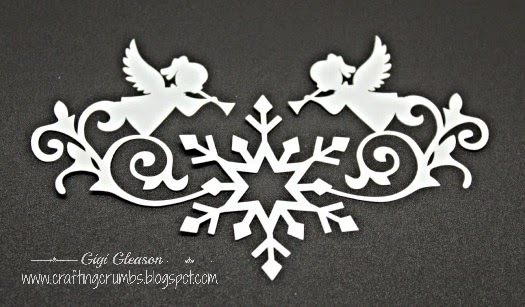 The greeting is just a font cut out of silver mica and placed over black and silver sparkly ribbon. 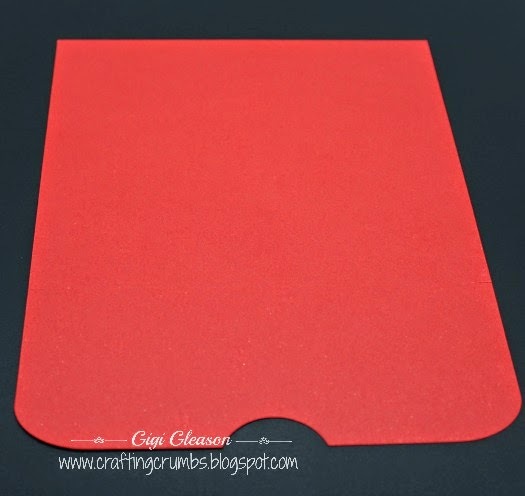 The sparkle cardstock from PT pulls all of the pieces together as the card base. As a teenager, I can remember seeing my Mom, who rarely snacked on anything, utterly obsessed with Quaker granola. Like most of us at that time, she thought it was good for her. All granola was good then right? Life was so much simpler then too..... or so we thought! I guess the love of granola lay dormant in me for decades and recently resurfaced. 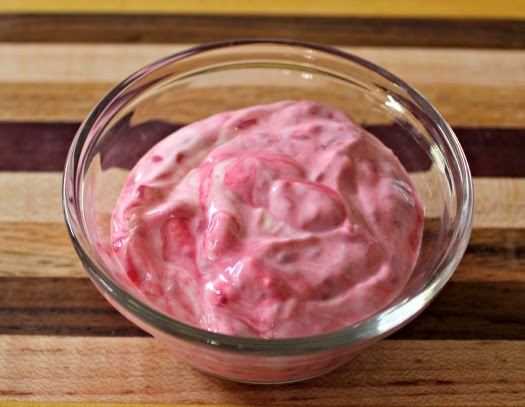 I love snacking on it plain, eating it for cereal with just a little milk, topping my homemade yogurt with it - but like my Mom, it was not as healthy as I thought it was. Sure I bought it at a health food store (no guarantee there! ), but it was still loaded with sugar and who knows what else. So I finally decided, after seeing blog after blog share a favorite recipe, that it just couldn't be that difficult to make. And you know what? It was even easier than I imagined. And you can customize it however you want. Best of all, you know exactly what is in it. 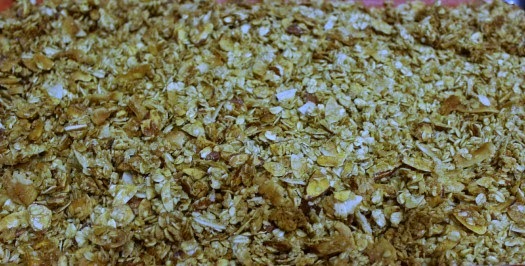 *I liked the different textures from coconut shreds and shavings (larger pieces) but you can use one or the other too. Preheat the oven to 325.. 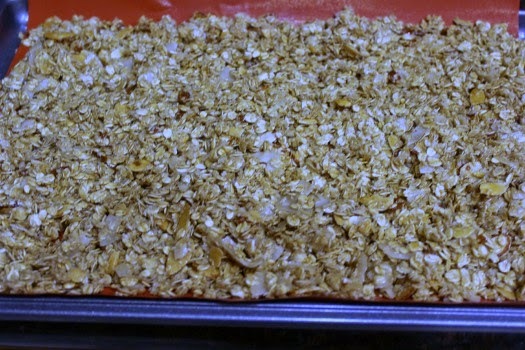 In a large bowl, mix the oats, baking spice or cinnamon, salt, coconut and honey roasted almonds. 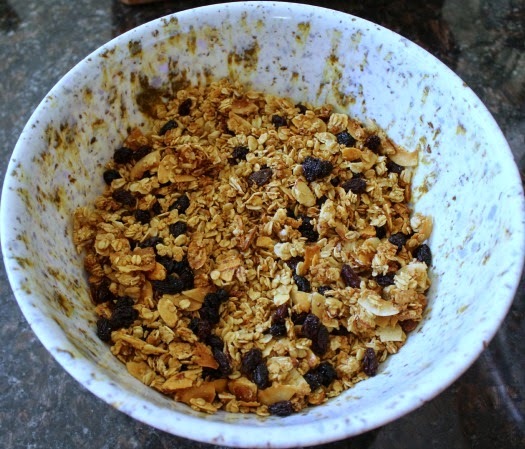 Mix it really well and then add the maple syrup, coconut oil and tsp of almond extract. 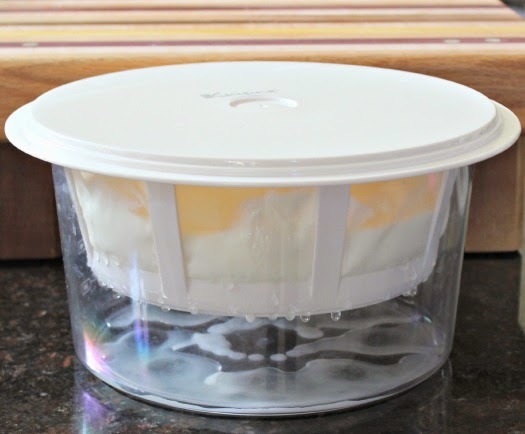 When it is cool, store in a large airtight container. 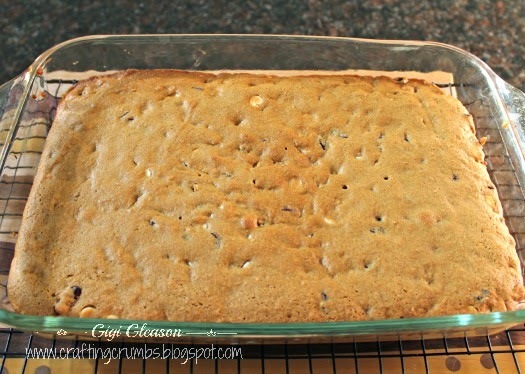 I added raisins to the cooled batch before storing. I had raisins to almost everything - I love them. Chopped dates would be great as would diced dried apriocots. Customize to your own tastes. So good! I store mine in a cereal keeper. And I label everything. You should see my pantry with all of the flours I am trying..... all labeled. I love yogurt. But I have come a long way from what I first loved about yogurt and what I ate. As a little girl, I remember there was always yogurt in the refrigerator. My dad came home for lunch every day and would always grab a yogurt - the fruit at the bottom kind. I loved those too and used to mix up just enough in the rest of the yogurt so I would have a layer of that "sweet" fruit at the bottom of the cup. It tasted so good. Sure it did - it was pure sugar!! Of course I had NO clue then nor did I care. And I continued to love those until..... well for a long time! So when did it all change? When I found my new yogurt love - Greek yogurt. I thought it was a magical concoction of thick yogurt goodness. Little did I know there was even remotely mystical about it. 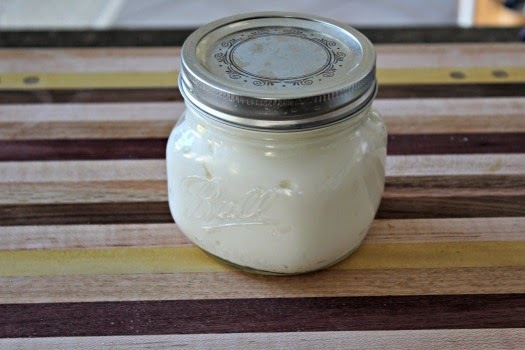 Fresh strained regular yogurt = Greek yogurt. No special ingredients - nothing. So when I started making my own yogurt about six months ago I did a lot of experimenting, to try to get the right consistency and flavor. I learned the longer I cooked/cultured it the tangier it got, and I am not a fan of plain yogurt. But that is how I made it because it was more versatile that way and I could use it in a variety of ways - baking, cooking, eating as is. 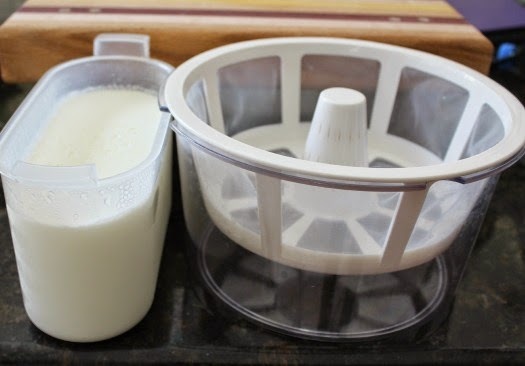 And it's simple - whole milk (makes a better, more satisfying yogurt but lowfat milk can be used, dry whole milk powder, and yogurt culture - that's it). 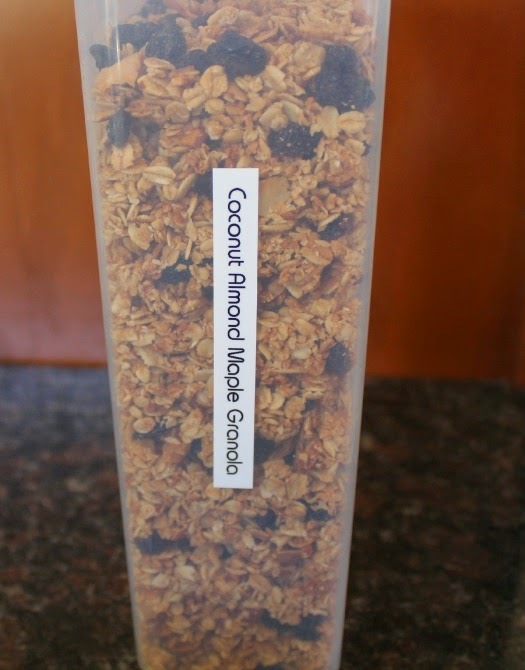 Now when I make yogurt I often do two batches, one plain so it can be a sour cream substitute, and one with vanilla (and sometimes honey) so I just need to add a little fruit and/or granola to have it ready to eat! I love that it is all natural and that I control what is in it. 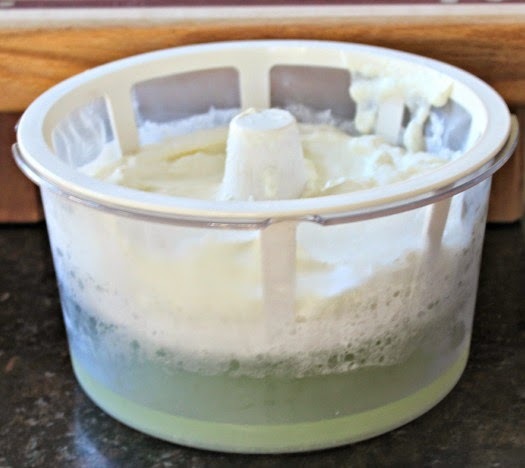 I love that I can leave it as is, or strain the whey off for four-six hours and then have Greek yogurt. It makes me smile because now it is really good for me. into the strainer to start the process from regular to Greek! 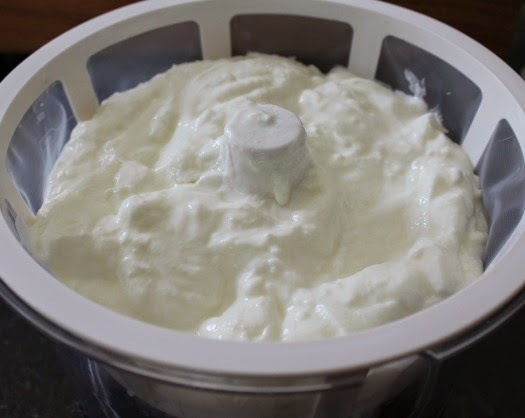 after about 4-6 hours, a much thicker yogurt emerges - Greek yogurt! ready for the fridge...... and to eat! this is made with homemade low sugar raspberry jam and a little vanilla extract. 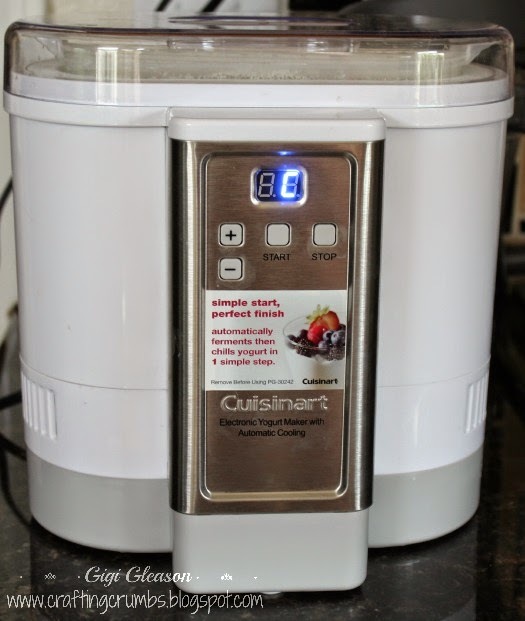 I have also been making homemade ice cream and frozen yogurt. It is perfect as a base for that - more on that in another post! All I can say is YUMMMMM! And I have to share something I recently tried. I am not a big fan of honey. I don't dislike it, it's just not the first thing I grab when I want something to go on toast or with peanut butter or - well you get the idea! It's just not my favorite thing (but it is great on hot biscuit :) ) Anyway, this base is greek yogurt and honey - that's it. And it is amazingly good. I love the gentle flavoring of the honey as it delicately sweetens the tang of the yogurt. OMG! A new must have! These are just a few ideas based on what I did with summer fruit. Sauteed apples as fall sets in with a little cinnamon and vanilla would be sooooooo good . The possibilities are endless.